Finally I managed to complete 107FL binoscope system while gathering missing parts from a friend – Jim, and enjoyed solar binoscope viewing today. Thanks, Jim. Temporary setup, very unstable, filmsy and dangerous since it looks collapsed. This is only way I can do right now anyway. Original 90FL box is still big enough for 107FL. A bit tight though. BinoTechno Body and a pair of diagonals were round-tripped to NY for NEAF. Although I didn’t originally intend, this turned out the perfect 2-time stress tests by the notorious USA ground shipment. Collimation? No problem at all!!. 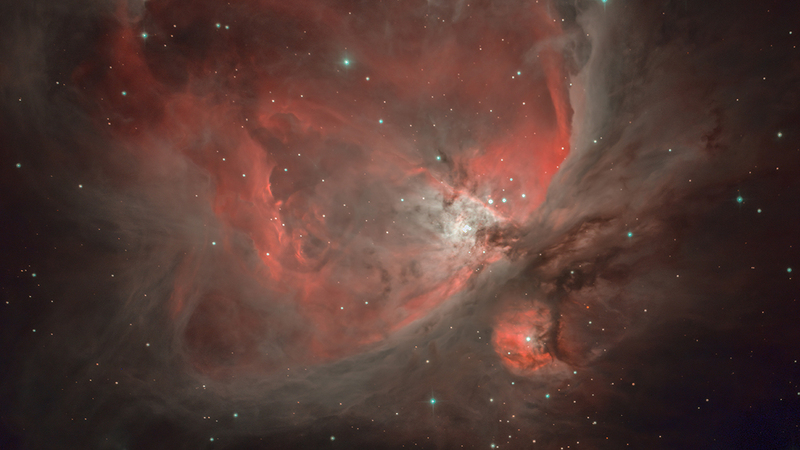 I looked thru eyepieces and tweaked mirror collimators a little bit. Done within ten seconds. Both images were completely merged now. BTW, this was my 1st fine tuning with mirror collimators. So I can clearly say this is “USA shipment-certified” product, which means it can be shipped all over the world without any concerns. So I have concluded the system is still free from the initial alignment even after 10,000 miles journey including over the Pacific ocean. One of 2″ sleeves was scratched during the returned shipment. Sad. My fault. My packing wasn’t good. But as mentioned the above, fortunately there is no mechanical mis-alignment at all. This was an another practical test as a result. I didn’t wish that though. Hattori-san, your concept is quite right. It proves it is super rigid and precision body. ps. I setup tonight. But unfortunately no stars due to the marine layer. I hope tomorrow or later. 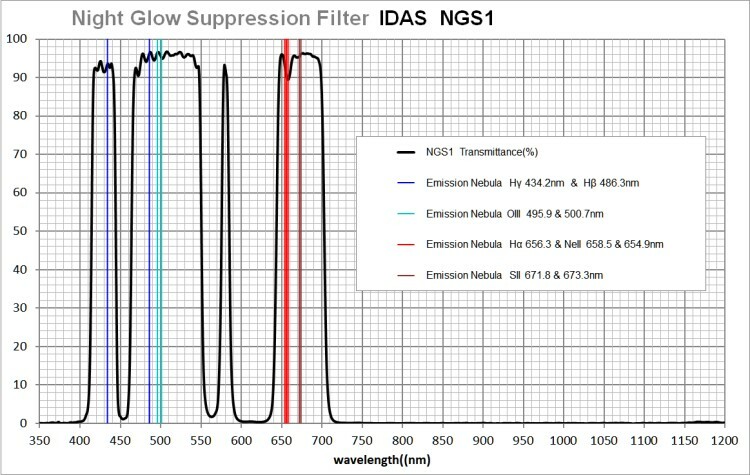 Following the Nebula Booster(NB1) released in this January, today the market leader for the optical filters – IDAS Japan announced an another innovative filter called “Night Glow Suppression” filter(NGS1). This is, as usual, the industry-first product as categorized for improving your image’s sky background. NGS1’s key concept is to maintain working with the modern and traditional man-made city lights as well as focusing on the natural space glows thru one filter. See an actual response curves below. As always, IDAS’s published data is the production’s measured value. So this shows what you actually get in your hand, unlike some others. I think green cast comes from OI(557.7nm) and orange/red backgrounds come from NaI and 600nm range’s OI, if my understanding is correct. Since sky glow is more visible under the dark and the transparent sky, this filter should be more valuable at the dark places as well as high elevation sites. So IDAS filters ARE NOT only for light polluted sky anymore. Usually night glow is overwhelmed by man-made city lights. [LPS] is now a kind of trademark to flight with various sky glows. So as marketing term to make it simple, probably I’m allowed to describe [this is the LPS filter for the dark sky]. But keep in mind, NGS still works for modern and traditional artificial street lights like white LED and high/low pressure sodium vapors. Multiple tasks are packed all in one. IDAS doesn’t stop. 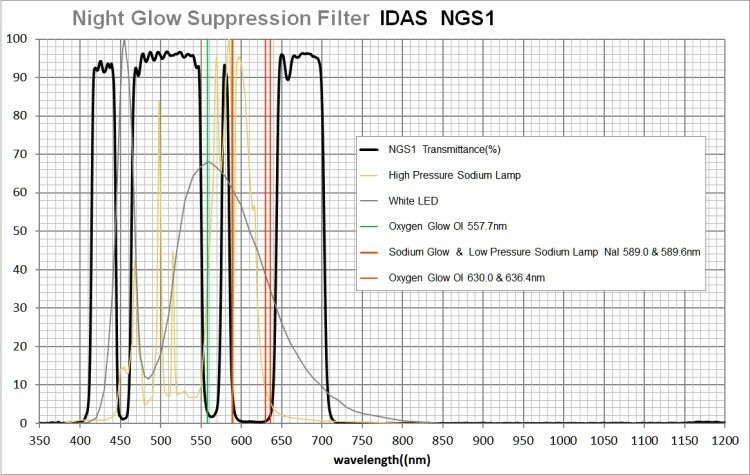 Further more, IDAS is planning to release quite new type of filter system soon. These will be, once again, the world-1st filters. Stay tuned on IDAS channel!! BTW, last night I accidentally found out very interesting Japanese site, which contains a following LPS data. This was 1st LPS production lot. It says produced on June 25th 1991(!! ), and measured by Hitachi U4000 instrument and set at 1nm resolution on June 26th 1999. 20 years ago!! It was originally called NRF-JPN (Noise Reduction Filter for Japan). But since it was being exported, it was renamed “LPS-P1”, then it continues to LPS-P2 so and so. Anyway this was the start of LPS history and our business relationship. 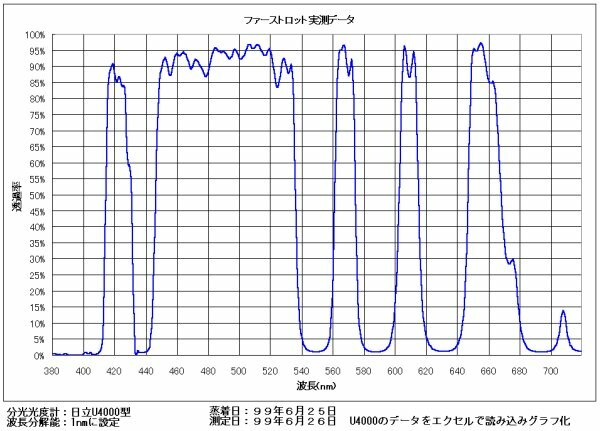 Aonuma san – a genius optical designer already made this innovative filter 20 years ago. Nothing obsolete even today. It’s amazing, don’t you think so? I will write up more details of LPS story one day. As shown above, he published the measured data from 20 years ago and continued to do so!! No exception. You should be able to easily evaluate his quality products. Finally Mizumura san, thanks for keeping this page up online 20 years. 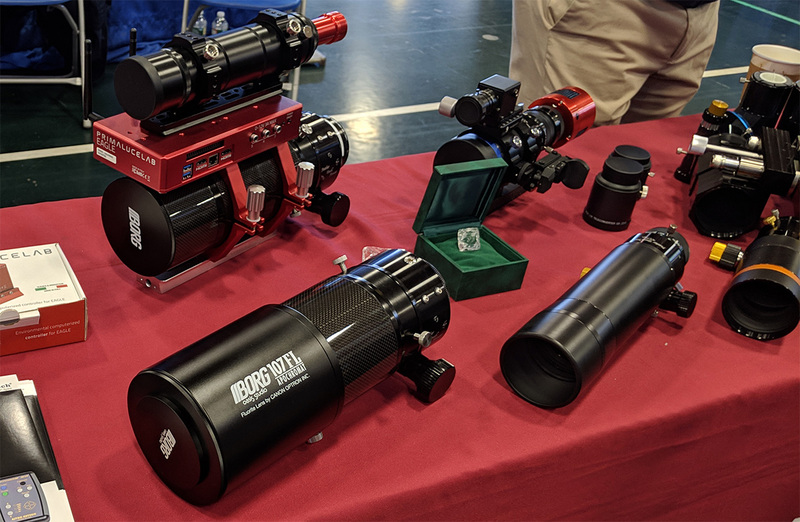 Now we are ready to take an order for BORG binoscope complete sets. 90FLs and 107FLs along with FTF-2020BCRs are now available. Since I don’t have heavy-duty single fork mount, I just temporarily set on the conventional tripod. There are several M6 holes at the bottom. So easy to set like this. Shame! !, I have only one of each objective at this moment. This 107FL was even bought back from my friend – Jim since my 107FL was forced to be released too. Masuyama 2″ 26mm looks the good match with current BORGs. Anyway, customers are first. 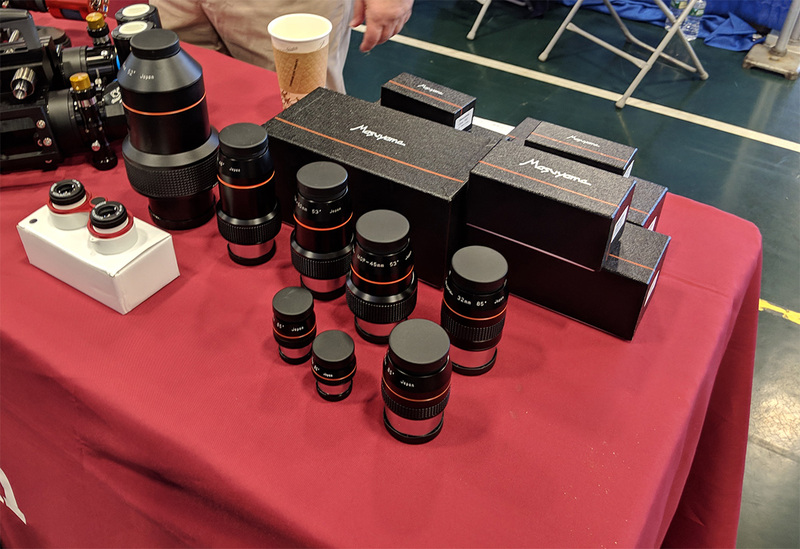 I wonder when I can finally build up a pair of lenses. 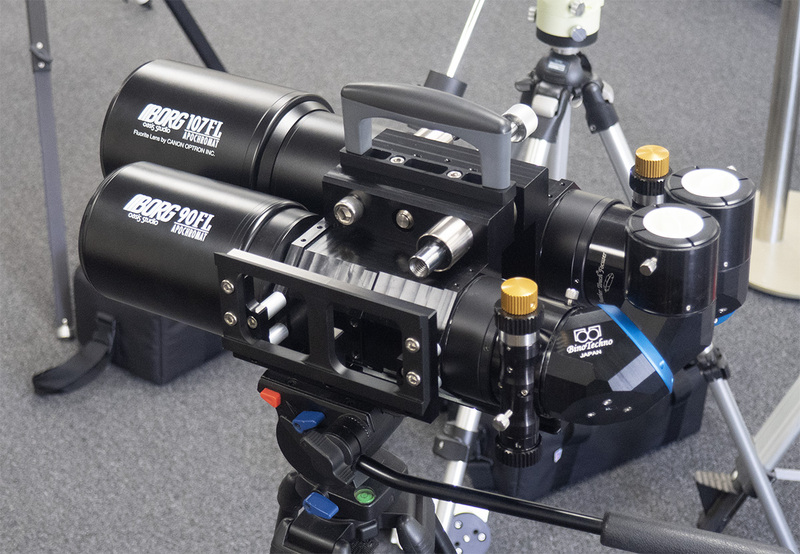 I was told by many binoscope users Masuyam 26mm showed the clean star images entire field of view. I’m looking forward to that. I noticed traditional Masuyama orange lines are good indication for the eyepiece level alignment. As some are aware already, Takahashi PM-SP and PM-1 have been discontinued, and recently their inventory has been sold out too. So we can’t take an order for any of mounts. Some accessories are still available for current mount users. If parts you are looking for are missing, e-mail to me. I will check the stock with Takahashi Japan. A tripod is a new item. So I’m sure it should be available for a while. I saw and touched it at Takahashi booth during NEAF. Solid and lightweight as expected. Highly recommended. It still fits Hutech a coupler to convert it to standard 3/8″ falt-top interface. I’m receiving more feedback on NB1 filter these days. These are 1st test shots with NB1 from Jim Windlinger. According to Jim, the color balance was pre-set at 100% each with MaximDL and was slightly tweaked in post processing. 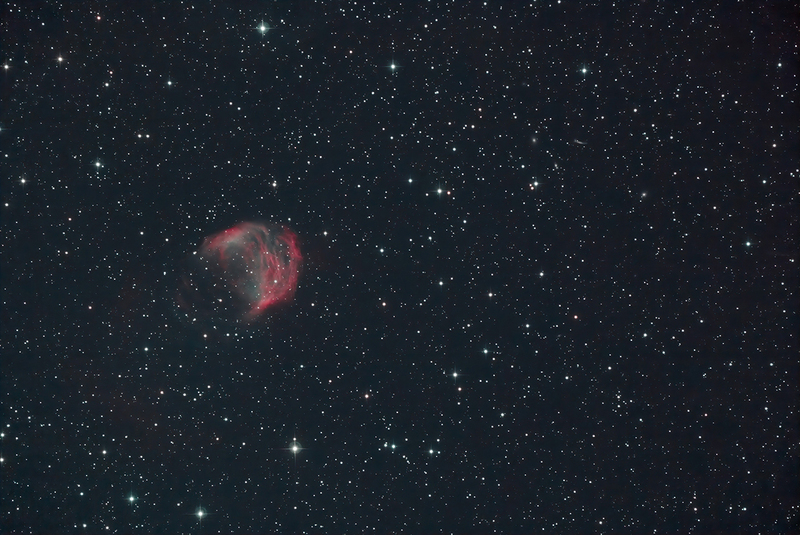 M42 NB1 has 1 hour of exposure time. 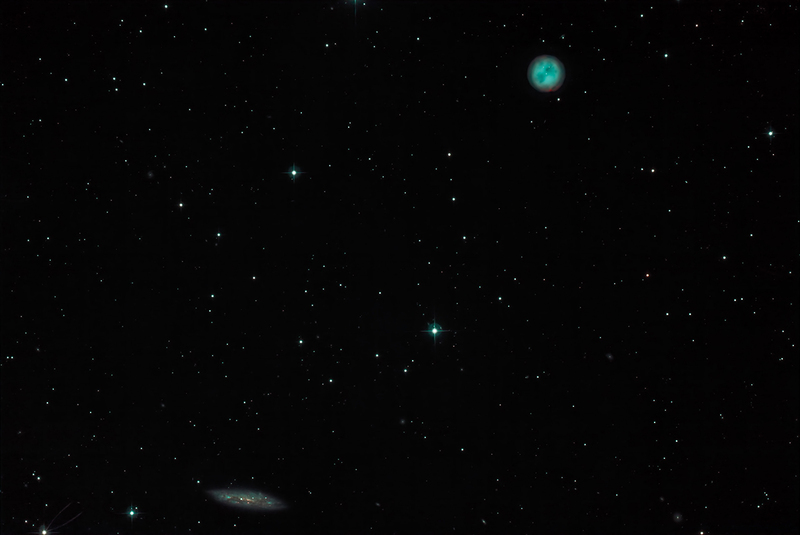 M97 M108 have 2 hours of total exposure time. Medusa has 1.5 hours of exposure time. Location: OCA Anza site under fair to poor seeing. Cropped version. NB1 looks still useful for galaxies too. The best should be blended with wide-band RGB. Thank you for your initial feedback, Jim!! Following filters will be commercially available from IDAS shortly. 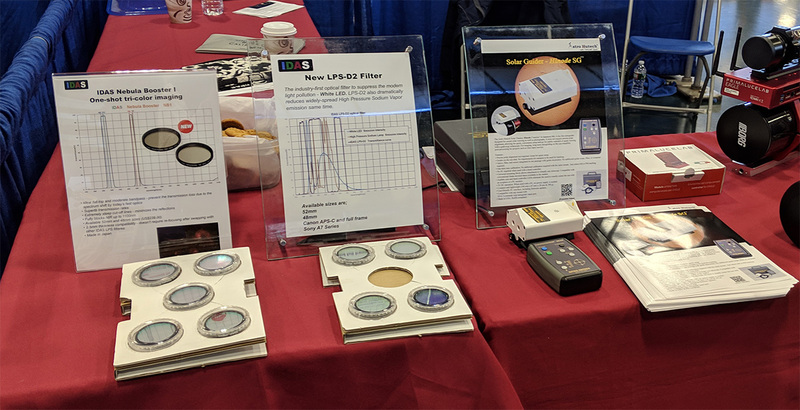 These filters are fully optimized with Hutech modified R and RP cameras, or done by someone else based on Hutech method and quality standard(= +/- 0.003 mm entire the sensor). 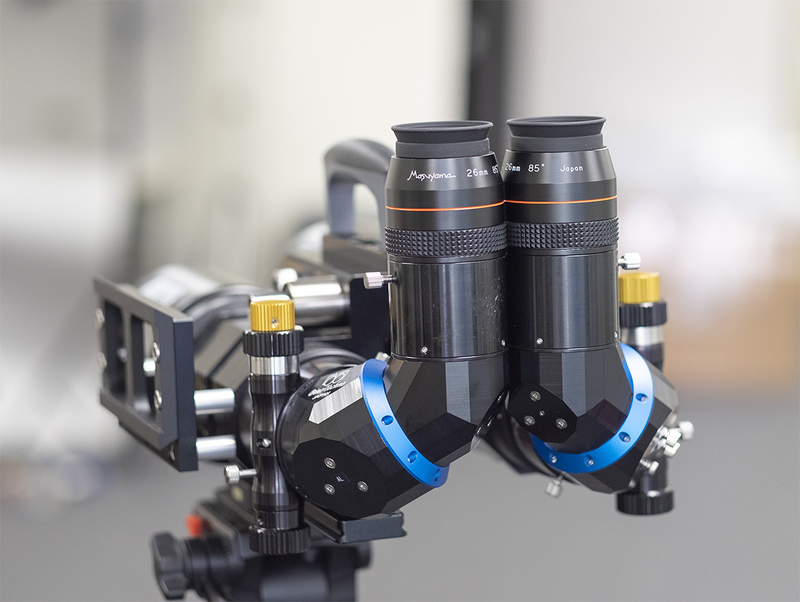 So you can use RF lenses without any compromise. Another new item is the drop-in filter. 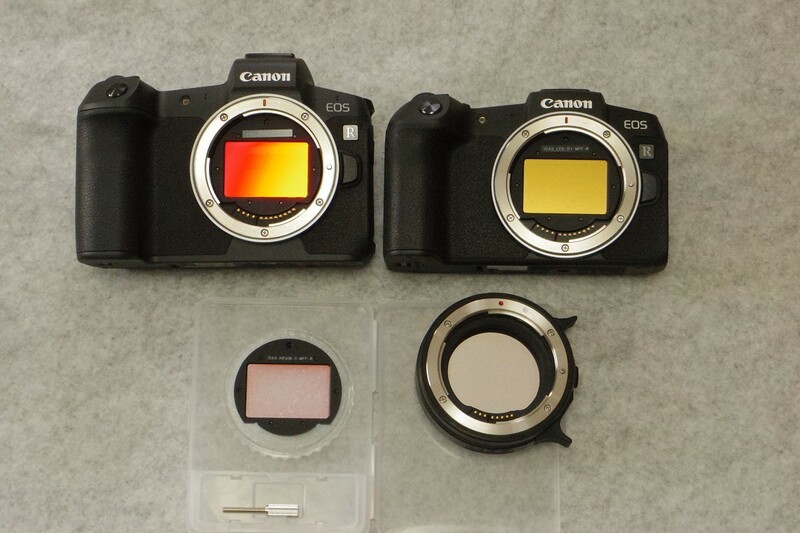 It allows to set two filters inline with Canon EF or its compatible lens. Whenever it comes right time, I will describe the details why and how two filters are used same time. This will lead you to quite new imaging world and give you more exciting experience. IDAS filter holder is designed to fit Canon original RF-EF filter adapter. So a lens is still electrically controlled from a camera body. Stay tuned on more IDAS new product coming up. 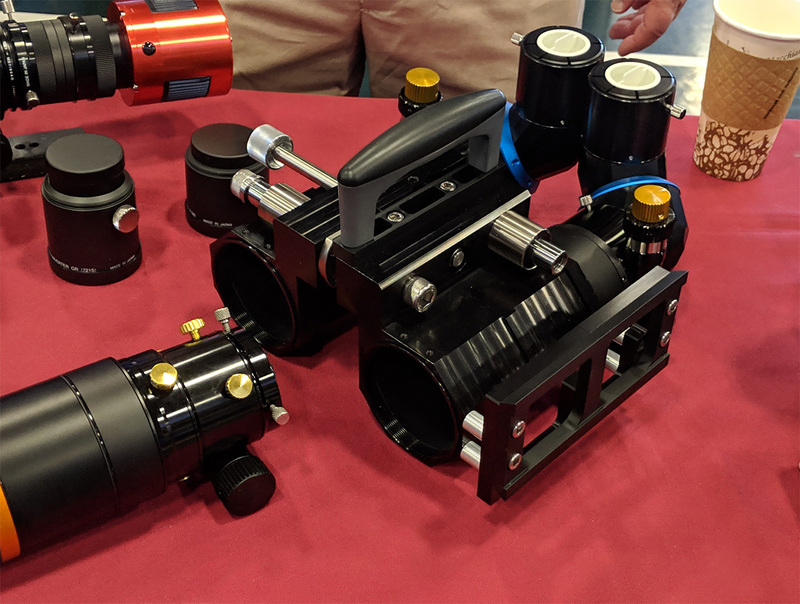 BTW 1st Hutech-enhanced RP camera user – Allen Ruckle updated his work. 1st image shown here was a single shot taken in JPEG. 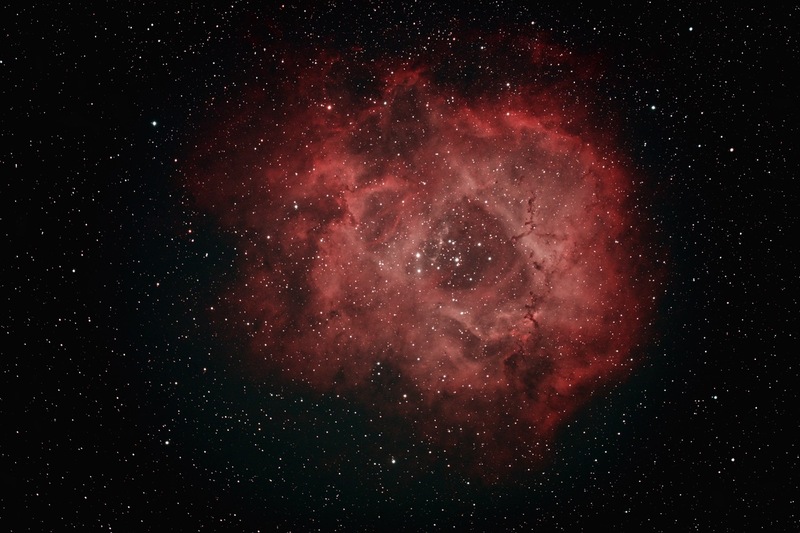 Following is the result of the stacked 10 frames from RAW thru IDAS NB1 filter. RP camera looks creating really clean image for us. I came back from NY yesterday. Thanks for stopping by Hutech booth. Nice discussing with all of you! 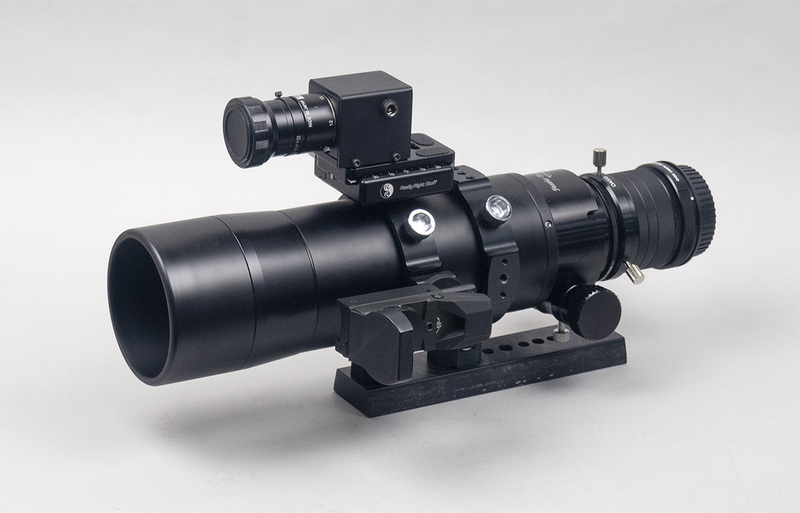 Japanese new BINO manufacturer – BINO-TECHNO. Initial alignment-free BINO body. A lot of attention! !